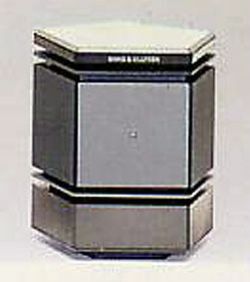 At the base of the BeoLab Penta column was the BeoLab 150 amplifier with a power output of 175 watts DIN/IEC. This could give your music a tremendous boost, both to the quality and the actual power output. 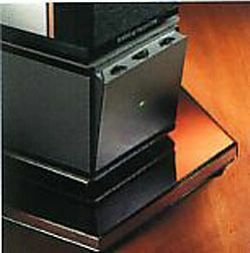 It was ideal if you loved to party but had a relatively small music system. Big power needs careful control - so the amplifier was equipped with Bang & Olufsen's Dynamic Soft Clipping system. This was a circuit that prevented both distortion and damage to the speaker units by softly rounding off signals that were too powerful. Another circuit prevented damage due to prolonged overloading. On the amplifier itself were buttons for adjusting bass and the level of sensitivity. This meant that you could arrive at a permanent adjustment that matched the room exactly. 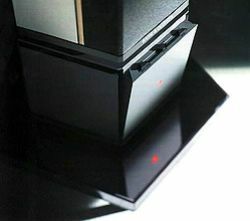 BeoLab Penta turned on automatically when it received a signal and also turned itself off three minutes after receiving the last signal. BeoLab Penta had a light display that indicated the volume level and which sound source the music was coming from. This was especially useful with Beosystem 5500 and Beocenter 9500. Connections: At the bottom of BeoLab 150 were two clip-sockets and a four pole DIN socket for connecting speakers, a line input phono socket and a mains cable. The BeoLab amplifier in the base of later BeoLab Penta models gave music an incredible lift. And what it did for the sound in Penta, it could also do for other loudspeakers. BeoLab 200 was therefore offered separately so that more could realise its potential.